Empower real-time nutrient data to transform decision-making. Status Update: Due the government shutdown, we were unable to respond to some of your questions and know that the shutdown posed some difficulties for teams working with various government programs. Therefore, we are extending the deadline for submission to February 28, 2019. Click here to view the full informational webinar from March 15th. EPA, in collaboration with other agencies, is seeking demonstrations of the use of data and information from nutrient sensors to inform decisions and actions that address nutrient management. The total prize amount for this Challenge is $100,000; up to two winning teams will share the prize. This is Stage II of the Challenge; Stage I was a call for action plans, which was completed September 2017. Excess nutrients (nitrogen and phosphorus) in the nation’s waters is one of the costliest and most challenging environmental problems we face. Over the last 50 years, the amount of nutrients entering into our waters has escalated, and is now one of the top causes of water quality impairment. Protecting human health and the environment from adverse impacts of excessive nutrients is a national priority. Many organizations and communities are interested in making use of sensors to provide improved spatial and temporal data that can help inform decisions and actions to protect and restore our nation’s water resources. This Challenge calls for teams to design and implement an approach that utilizes nutrient sensors and resulting data to improve decisions and actions resulting in more effective nutrient management. 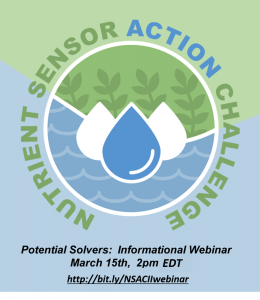 The Nutrient Sensor Action Challenge is open to communities, tribes, states and other organizations in the United States interested in deploying nutrient sensors to address an important nutrient-related water quality issue. Organizations should be currently engaged in water quality monitoring and have some level of experience using sensors, managing data, and communicating that information. Participation in Stage I of the Challenge is not a requirement for participation in Stage II. Teams must complete the registration form, found here, and upload via the Challenge.gov "Submit Solution" tab two weeks prior to the start of monitoring and data collection from nutrient sensors. Teams must acquire monitoring data from two or more nitrogen or phosphorous sensors for at least three months between March 1 and December 31, 2018. At least one sensor must cost less than $15,000. Projects will be requested via email to share web service endpoint(s) and associated authentication information. Data must be made available by November 1st, 2018 and remain available to the Challenge Administrator until judging is complete (Spring 2019). All materials must be uploaded to Challenge.gov "Submit Solution" tab. Materials submitted via regular mail, facsimile, or email will not be accepted. No additions or modifications to the uploaded submissions will be accepted after the deadline. Participants are encouraged to include hyperlinks and access instructions to external websites. If a website(s) is part of a larger solution offered, participants should provide specific information in the document that indicates which parts of the website relate to the Challenge. Describe the potential impact of the contribution of continuous sensor data and how it has or will inform and improve a decision or action to improve nutrient management. Describe engagement with users, stakeholders and decision-makers and how their role and participation contribute to the impact of the project. Describe how quality assurance and quality control was addressed throughout the project. The extent to which the project monitoring design, sensor data collection, and analytics are appropriate and effective to inform the decision or action pertaining to the identified nutrient issue. The extent to which the project meets Challenge requirements pertaining to data standards and data access. The extent to which the project demonstrates an important impact or benefit of sensor data to inform a decision or action pertaining to nutrient management. Webinar presented on 1-30-2018 where USGS and Casco Bay Estuary Partnership discuss best practices for nutrient sensor deployment. Webinar presented on 2-6-2018 focusing on usage of web services that have been selected to support the interoperability requirement. Webinar presented on 2-22-2018 reviewing Stage I of the Nutrient Sensor Action Challenge and looking forward to Stage II. Webinar presented on 3-15-2018 summarizing Stage II of the Nutrient Sensor Action Challenge and reviewing the Challenge.gov page. Is participation in Stage I a prerequisite for participating in Stage II? No. Teams are invited to participate in Stage II, even if they did not participate in Stage I. 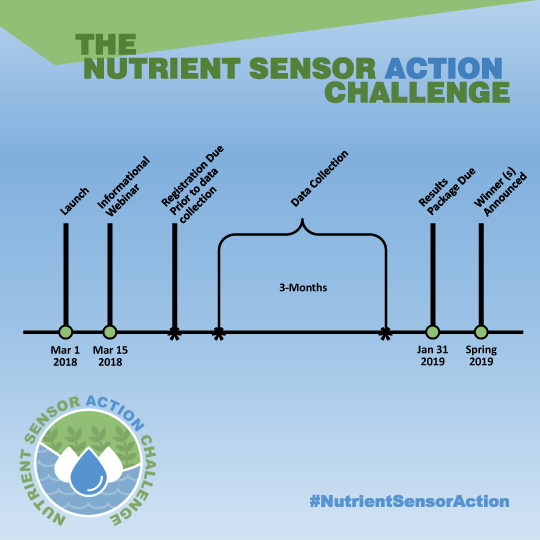 The Nutrient Sensor Action Challenge seeks breakthroughs and innovative solutions that demonstrate how nutrient sensor information can be translated into knowledge to support decisions and actions pertaining to a nutrient-related topic or problem. Which nutrients are within the scope of the Challenge? The Challenge is open to companies, organizations, and/or communities interested in deploying two or more nutrient monitoring sensors (one of which has a purchase price that does not exceed $15,000) to address an important nutrient-related topic or problem. Participants should be currently engaged in water quality monitoring and have some level of sophistication with water monitoring, data management, and communication. Team leads must be United States citizens. Is there any assistance in helping match organizations into teams? Is the focus of this Challenge non-point sources of nutrients, or can wastewater treatment plants participate as well? The focus of the Challenge is not restricted to non-point sources. Wastewater treatment plants as well as other companies, organizations, and/or communities interested in address an important nutrient-related topic or problem are also encouraged to participate. How long is the Challenge open? Data collection is open from March 1, 2018 - December 31, 2018; participants have flexibility to determine the 3-month window during which they will monitor and collect data. Data must be made available via web services by November 1st, 2018 and remain available to the Challenge Administrator until judging is complete (Spring 2019). How should interruptions for maintenance, repairs, etc. be reported and accounted for? Interruptions are understandably going to occur. Please describe anticipated interruptions to the best of your ability when submitting the registration form. Interruptions should also be noted in the final results package. What are the price constraints for the sensors? The purchase price of at least one of the sensors used should not exceed $15,000. This price constraint applies only to the sensor itself; it does not include other deployment costs such as communications, batteries, cables, etc. If a sensor were to be provided to a team free of charge, how should the price of the sensor be reported? Verification/validation that the sale price of the sensor not exceeding $15,000 should be provided. Is there financial assistance for purchasing sensors? There is not any financial assistance for sensor procurement. However, sensor manufacturers may be willing to loan sensors for the purpose of piloting. Is there a minimum/maximum requirement regarding the number of sensors? Solvers must submit plans to deploy 2 or more sensors; one of which should have a purchase price that does not exceed $15,000. There is no maximum limit of sensors. Do sensors need to be acquired from U.S.-based organizations/companies? Does this program recommend or endorse a particular sensor or brand? This Challenge does not recommend or endorse any brand of nutrient sensor. Information about sensors that were evaluated as part of the 2014 Nutrient Sensor Challenge can be found at http://www.act-us.info/evaluations.php . Additionally, a list of sensor developers from the 2014 Challenge can be found at: http://www.act-us.info/nutrients-challenge/Participants.php . Participants in this Challenge are not limited to the sensor brands/developers mentioned above. Where can I find information about the data and interface standards? Will judges need to have real-time access to the data? Data needs to be made available to the Challenge Administrators by November 1, 2018. The Challenge requires data to be made available in interoperable way, meaning the judges can access and see the data via web services. A data 'download' will not be accepted at the end. Teams must set up their data system in such a way that the data will be shareable in a standard format over standard communication protocols. A goal of this challenge is to promote standard ways of sharing and formatting sensor data to encourage interoperability and sharing of water monitoring data. See Challenge language for data standards accepted by the Challenge judges. Who are the partners in the Challenge? Are slides from previous webinars available? How can I be added to the e-newsletter distribution list? Up to two winning teams will share the prize. Teams must complete the registration form and upload via the Challenge.gov "Submit" option two weeks prior to the start of monitoring and data collection from nutrient sensors. All materials must be uploaded to Challenge.gov through the "Submit" option. Materials submitted via regular mail, facsimile, or email will not be accepted. No additions or modifications to the uploaded submissions will be accepted after the deadline. Participants are encouraged to include hyperlinks and access instructions to external websites. If a website(s) is part of a larger solution offered, participants should provide specific information in the document that indicates which parts of the website relate to the Challenge.